A cast of 19 East Bay High School student actors (and crew of seven) will present Ray Bradbury’s Fahrenheit 451 Feb. 14 to 16 at the Kathryn Hill Auditorium, 7710 Big Bend Road, Gibsonton. Tickets are $5. Because of its subject matter, the play is not recommended for children. Imagine living in a world where books are illegal, where the state fire department seeks them out and burns any it finds. This is the dystopian world of Ray Bradbury’s Fahrenheit 451, an imagined society in which all education and entertainment comes through programmed TV. People no longer know how to think critically. 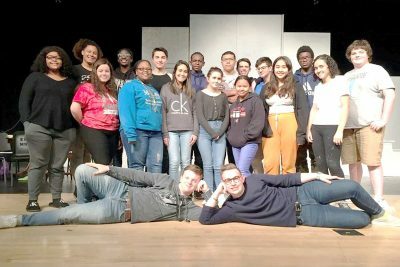 The East Bay High School Theatre Department will present this futuristic drama Feb. 14 to 16 at the Kathryn Hill Auditorium, 7710 Big Bend Road, Gibsonton. All of the two-hour shows have a 15-minute intermission between acts and start at 7 p.m. The doors open at 6:30. Fellow senior Crimson Enlow, the play’s stage manager, agreed. Grey Taylor, the student playing Montag, sees present day parallels. Fahrenheit 451 has received numerous awards, including the American Academy of Arts and Letters Award in Literature and a spoken-word Grammy nomination. Because of its subject matter, the play is not recommended for children. Tickets for adults and students may be purchased at the door for $5 per person. Groups of 15 or more can make reservations to ensure a block of seats. The East Bay Theatre Department competed in the District 9 Thespian Festival in early October, and its Thespians took home nine superior ratings, including a District Level Critics Choice Alternate Award. Its final performances of the year will include the musical revue Showstoppers 3.0 March 7 and The Little Mermaid musical May 9 to 11. To RSVP for Fahrenheit 451 or for more information, call 813-671-5134, ext. 271.